I finally made it back to Fun Buns NYC to check out the baguette. After enjoying a trio of buns recently, I wanted to see if the expanded menu, which now includes sandwiches, is as good. Also, I gave the beef bao a second shot, and — spoiler alert — boy am I glad I did! But first, the sandwich. 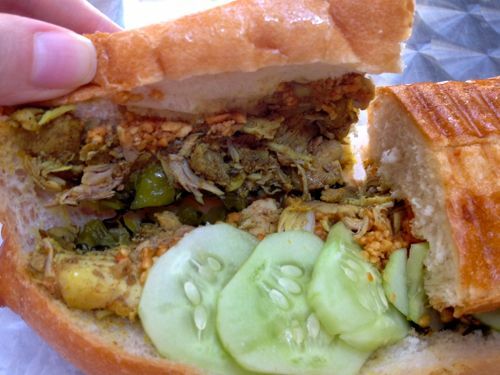 At $8 a pop, the sandwich appears to be a better deal than three buns, which comes in at $9. Size-wise, there’s no comparison — it’s a good sized baguette. I ordered mine with the chicken curry, since I enjoyed the flavors in the past and I thought the bread would soak up the sauce nicely. The filling-to-bread ratio on the sandwich is not as impressive as the bao. There was less chicken in the sandwich than I expected, and although there were picked greens in there, those flavors didn’t pop as much as they do in the buns. 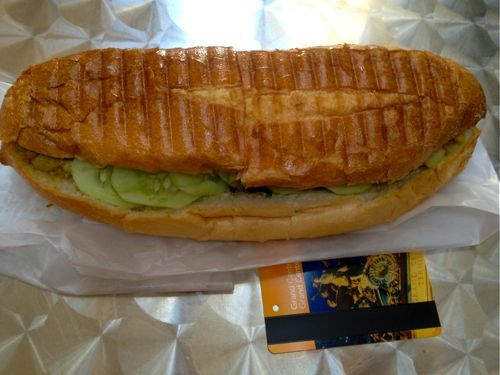 I also missed the daikon and carrots; instead, the sandwich includes cucumbers. Meh. As I had hoped, the baguette soaked up some of the sauce, which helped bring out the curry flavor. It tasted less like satay than the last time I was at the cart. Although the sandwich kept me satiated longer, I missed the delicate balance of Fun Buns’ signature food. When it comes to the beef buns, my suspicions from my last visit were confirmed. I must have caught them on an off day, because on my second shot, the bun was everything I was hoping it would be. The beef bun definitely steals the show. If you’re looking for an option with more substance, the baguette might work for you. 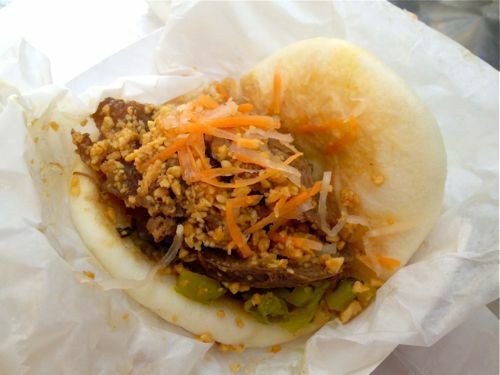 But, if you’re more interested in the balance of bun-to-filling ration, stick to the bao, and make sure one with beef is in your order. 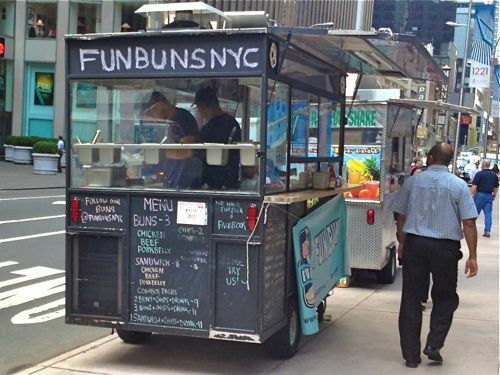 Fun Buns has been in Midtown a lot lately, especially on 48th street between 6th and 7th, but be sure to check their twitter handle before heading out. Posted by Rachel Goldner at 11:30 am, July 12th, 2013 under Fun Buns NYC. Just tried the pork and beef buns, overall this was pretty uninspired (meat was lacking flavor, mostly the same toppings on both buns) and the quantity was kind of small for the price. Not bad for midtown but I probably won’t repeat.